Murukku podi/Powder is a very easy and tasty snacks recipe which can attract ur kids easily. Its just a single step process..This recipe may be known to most of u but u might have forgotten about it.This post is to refresh ur memories :)..We all would have made thenkuzhal or mullu muruuku for Diwali and i hope u have some murukku leftover in ur pantry. Some kids hesitate/don’t like to eat mullu murukku as it pricks the jaws.I have seen toothless old people getting mouth ulcers by eating murukku.So,for those people, u can try this way. They’ll love it for sure. When i was young , kittu aachi( my dad’s periamma) used to come to our house to help my mom for making thenkuzhal murukku.She was a very old toothless lady. 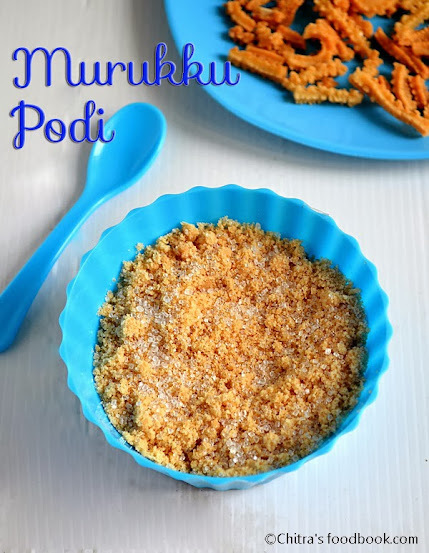 As she couldn’t eat murukku as such , my mom make this murukku podi for her and store in a box.She used to enjoy it a lot ..As kids , we too( me & my sis) used to take it in a bowl and have it after coming from school.A glass of milk and this murukku podi was our evening snacks those days during Diwali . Yesterday i tried this with leftover magizhampoo murukku for Raksha & she loved it. More than Raksha , myself and Sendhil relished a lot and we finished the bowl very quickly .Thenkuzhal murukku podi tastes the best according to me. Do try this murukku podi for a change if u have not attempted so far..U may love it like me . Murukku podi/powder is a very easy kids snack recipe which can be made in minutes using leftover murukku.. Break the murukku into pieces..In a dry mixie jar , take the murukku pieces.Grind till it becomes a nice powder..Remove it in a bowl , add sugar. Mix well and enjoy ! For sugar patients , please avoid adding sugar. Just powder and give .. If u have spicy murukku in hand , u can powder and have it as such. Nice and unique snack. Never heard of this. Awesome idea, will try it. Chithra...u r awesome with your unique recipes..
We had murukku podi in one of our Nagarkoyil friend's house. She added grated coconut and sugar along with murukku podi! :) Nice way to make an interesting snack by the way! Adding grated coconut is a great idea. will try ! O wow.. Such an interesting snck that one will never think of.. :) Perfect for kids as well as grown up kids! Nice..we used to have the podi mixed with curd,red chilly powder and salt and sometimes even chaat masala. remembering my childhood days, my grandpa had like this(but without sugar)..
Nice use of finishing the leftover murukkus..fantastic..